Cambridge, Mass. 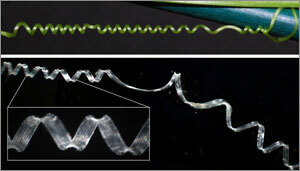 — Captivated by a strange coiling behavior in the grasping tendrils of the cucumber plant, researchers at Harvard University have characterized a new type of spring that is soft when pulled gently and stiff when pulled strongly.Instead of unwinding to a flat ribbon under stress, as an untwisted coil normally would, the cucumber’s tendrils actually coil further. Understanding this counterintuitive behavior required a combination of head scratching, physical modeling, mathematical modeling, and cell biology—not to mention a large quantity of silicone. 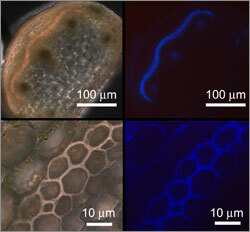 The result, published in the August 31 issue of Science, describes the mechanism by which coiling occurs in the cucumber plant and suggests a new type of bio-inspired twistless spring. Led by principal investigator L. Mahadevan, a Core Faculty Member at the Wyss Institute for Biologically Inspired Engineering at Harvard, the Lola England de Valpine Professor of Applied Mathematics at the Harvard School of Engineering and Applied Sciences (SEAS), and Professor of Organismic and Evolutionary Biology and Professor of Physics at Harvard, the researchers were motivated by simple curiosity about the natural world. "Nature has solved all kinds of energetic and mechanical problems, doing it very slowly and really getting it right," says lead author Sharon Gerbode, a former postdoctoral fellow at SEAS who has now advanced to a faculty position in the physics department at Harvey Mudd College. "But few people have studied biological mechanisms from the point of view of a physicist or an engineer. We barely had to scratch the surface with this question about the cucumber—how does it coil? What could be a simpler question? And what we actually found was this new kind of spring that no one had characterized before." Well-known to botanists and gardeners, the coiling tendrils of climbing plants like cucumbers, sweet peas, and grape vines allow the plants to hoist themselves up towards sunlight and secure themselves tightly to existing structures like trees or trellises. Yet the biological and physical mechanism of this coiling, at the level of the plant’s cells and tissues, has remained a mystery. A cucumber tendril begins as a straight stem that elongates until it finds something to latch onto. Then, secured at both ends, it forms a left-handed helix and a right-handed helix, joined at the center by a "perversion"—Charles Darwin’s strikingly Victorian term for the point at which the coiling changes direction. "It’s easy to create one of these twistless springs with a telephone cord," says Gerbode, "and they’re annoying. But with the phone cord, you can pull on both ends and it will straighten out into a flat ribbon. What’s strange about the cucumber tendril is that if you pull on the ends, it actually overwinds, adding more turns to both helices." To explore the mechanism for this behavior, Gerbode and her Harvard colleagues took a closer look at the cells and tissue types inside the tendril. A fibrous ribbon, made of thread-like cells called gelatinous fiber (g-fiber) cells, runs the length of each tendril. Two cell layers thick, this ribbon appears to provide the force required for the tendril to form a helix without the benefit of muscles. If the cells on one side of such a ribbon were to contract, the researchers thought, it would force the ribbon to curve and coil. Gerbode and her coauthor Joshua Puzey (Ph.D. ’12), who was studying organismic and evolutionary biology in the Graduate School of Arts and Sciences (GSAS) at the time, tried to reconstruct this fiber ribbon with a silicone model. They stretched a sheet of elastic silicone, secured the ends, and then spread a thin layer of silicone caulk across its surface. When the caulk cured, they cut a thin strip off the model, held both ends, and watched it coil into a pair of perfect helices. When they pulled on both ends, however, it simply unraveled and lay flat, adding no extra coils as they had hoped. "This is when I spent a lot of time pulling on telephone cords," Gerbode admits. The clue, as it turns out, was inside the g-fiber cells. These cells have been studied extensively in trees; they have the ability to shrink or elongate, thanks to a special type of architecture in the cell wall. "What we think may be happening is that the inner cell layer of the tendril has more lignin in it, which is a sort of glue that gives cell walls stiffness and holds together the cellulose microfibrils, which are like rebar in the cells," explains Puzey. “We thought this stiffness must be related to the coiling somehow." To test this idea, Gerbode and Puzey glued a fabric ribbon to one side of their silicone model and a copper wire to the other side. At last, the silicone strip formed a pair of helices that overwound, just like the cucumber tendril. The structure they stumbled upon is a spring made of two joined, opposite-handed helices whose bending stiffness is higher than their twisting stiffness. In other words, to form this specific structure, the materials involved have to make it easier for the ribbon to twist axially than to change its curvature. Through mathematical models developed by Mahadevan and coauthor Andrew McCormick (a physics graduate student in GSAS), the team was able to fully understand the parameters and synthesize a simple principle for the design of these springs. The final stage in the research was to address the biological implications. By extracting the fiber ribbon from a cucumber tendril, Mahadevan’s group had already noticed that moisture was playing a role in the spring’s behavior. As the extracted ribbon dried out, its stiffness increased and it coiled more tightly. Lignin is also known to be hydrophobic, repelling water. What’s more, Mahadevan’s team measured the mechanical response of young tendrils and older ones, finding that the older tendrils put up much more resistance to pulling, a fact that they explained using a combination of theory and computer simulations. Though the group has not yet explored these findings from an evolutionary perspective, they hypothesize that the mature coil structure allows the climbing plants just the right amount of structural flexibility. "You want the plant to make a nice strong, secure connection, but you also don’t want it to be too stiff or to snap," explains Gerbode. "You want it to have a little bit of flexibility so that if the wind blows or an animal brushes past it, it doesn’t break. So one possibility is that this overwinding allows the plant to easily accommodate small motions, but then if something really serious happens it can get very stiff and protect itself." To further study the evolutionary significance of the tendril’s morphology, researchers would have to study the coils in numerous species and attempt to reconstruct the evolutionary history of that characteristic. Mahadevan suggests that such a project could provide important ecological insights. "The advantage of using a tendril is that the plant saves on complex machinery to build structural supports such as trunks and branches," Mahadevan says. "The disadvantage is that it must depend on other species to build these supports. Thus, tendrils are an adaptation that is likely to develop only in regions replete with vegetation that can provide supports and where competition for resources is intense. "The real question remains this: how difficult is it to evolve such tendril-like solutions?"